A cough is often an accompanying symptom of seasonal allergies, common cold, and other ailments. You may experience a cough when you contact smoke and other irritating substances suddenly. Hacking and persistent coughs lead to pain in the throat and its surrounding muscle. Such coughs require medical attention and treatment. But you can also try essential oils for cough to relieve the pain and resolve the persistent coughs. Eucalyptus oil loosens any mucus in the lungs and reduces inflammation in the respiratory system. Rosemary oil relieves respiratory disorders including sinus infections, asthma, a whooping cough, and bronchitis. Cyprus oil prevents fluid accumulation the lungs. Lemon citrus treat throat infections effectively. Cedar wood relieves respiratory muscles and loosens mucus in the lungs. Peppermint oil is an effective treatment for dry coughs. Tea tree oil treats underlying infections and clears bronchial congestion. Jojoba oil can be of great help with its anti-inflammatory effects when combined with other essential oils for cough. Myrrh reduces mucus accumulation in the lungs. Sandalwood is an effective treatment for infections in the upper respiratory system. It relieves build up lung muscles as well. Angelica has expectorant properties that expulse phlegm from the lungs. Lavender oil relieves respiratory tract disorders. Rose oil relieves coughs associated with respiratory conditions such as allergies and asthma. Cajeput fights respiratory system infections. Frankincense oil clears the lungs and regulates breathing. Black pepper clears respiratory passages. Thyme oil has antibacterial,antiseptic andexpectorant properties that will help to fight against infections that cause cold and cough as well as drain congestion. Pine oil can help to loosen and get rid of mucus and phlegm from respiratory tract with its expectorant properties, thus helping curing cough and colds. With all the essential oils available, you should also know the effective ways to apply them so as to relieve your cough and associated symptoms. Adding a few drops of essential oils for coughin a diffuser can bring great relief for your symptoms. A diffuser breaks down the essential oils added into tiny molecules that spread into the air. The process is faster and more effective when using a high quality diffuser. The essential oils release natural ozone as they break down, which improves the quality of air in the room. The tiny molecules remain in the air for hours depending on quality of the diffuser, how long you diffuse, and air quality. Diffusing essential oils in the air fights sinus infections, congestion, flu, and colds. Oil-based throat lozenges relieve coughs. Keep the lozenge between your cheek and back teeth such that its juice drips down the back of your throat. Prepare balm by mixing 5 drops of lavender oil, one tablespoon of unrefined, organic coconut oil, 2 drops of thyme oil and 8 drops of eucalyptus oil. Rub one teaspoonful of the balm on your chest before going to bed. This balm relieves congestions and coughs. You will sleep well and breathe easily. Thyme has antiviral properties while eucalyptus relieves coughs and congestion effectively. Lavender has relaxation, antiviral, antibacterial properties. Add these and other essential oils in your list of home remedies. Place 4 drops of lavender and 6 drops of eucalyptus on a fresh pack of purse-size tissues. Place the oil in different parts of the tissues and then pack them in a zip lock bag. Carry the tissues in your purse whenever you have a cold. Hold one tissue near your nose when your nose is congested for relief. Breathing in the essential oil deeply relieves congestion. A mixture of lemon and eucalyptus essential oils relieves a cough effectively. Mix three tablespoonfuls of honey with 2 drops of lemon and 2 drops of eucalyptus essential oils. Add one teaspoon of this mixture to warm water in a glass and take slowly. 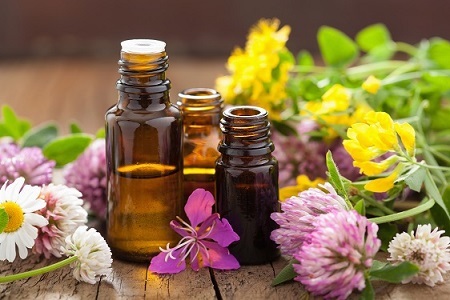 Essential oils for coughcan be used to make a massage oil to relieve chest congestions.Mix a drop of pine oil with 3 drops of eucalyptus oil, one teaspoon of jojoba oil and 2 drops of thyme oil. Use this massage oil to rub your back and chest. A sore throat is a sign of a cold. You can treat a sore throat by gargling warm, salty water. Add a drop of tea tree and ravensara to the solution for a more powerful gargle. Ensure that the droplets of both essential oils break by stirring the mixture vigorously. Sip a small amount of the mixture, gargle for 30 seconds and then spit. Gargle several times and keep stirring the mixture before each gargle. This treatment is effective when used every 4 hours. You can use white thyme instead of ravensara but do not exceed one drop on white thyme oil. An alternative way of using essential oils to relieve a cold or cough is adding them to a hot bath. Use 6 drops of tea tree and 2 drops of white thyme or ravensara in your bath. Do not exceed 2 drops of thyme because it causes skin irritation if it does not dissolve properly. Using bath base dispersant will help in dispersing the essential oil in your bath water. Do not exceed 8 drops of all essential oils used. Children can use essential oils for cough. However, you can only use organic products and that are safe for children. Consult a physician if you are unsure about any essential oil. If your child has sinus infections or cough, apply your preferred essential oil several times until the condition resolves.